Women hold 49.5 percent of payroll jobs. The health of the female workforce is hugely important to the health of the overall labor force. And yet—in crucial ways—lawmakers in the United States have avoided commonsense policy changes that have been shown to make it easier for women to balance paid work and their still disproportionate share of responsibilities at home. Policies like paid parental leave and subsidized child care increase parental labor force participation, which would boost the economy. Many of our peer nations have such policies, and, not surprisingly, their employment rates are much higher than ours. The figure below shows just how far U.S. women have fallen behind some of our international peers. 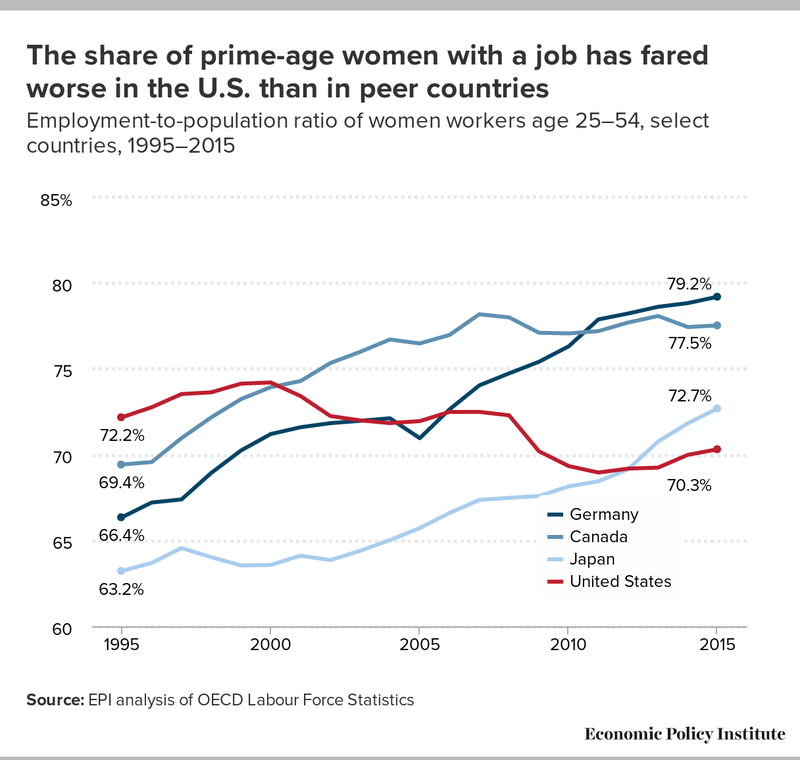 The graph shows the share of women age 25–54 with a job between 1995 and 2015 in Germany, Canada, Japan, and the United States. While women’s prime-age employment-to-population ratio (EPOP) rose over that 20-year period in those peer nations, it actually fell in the United States. 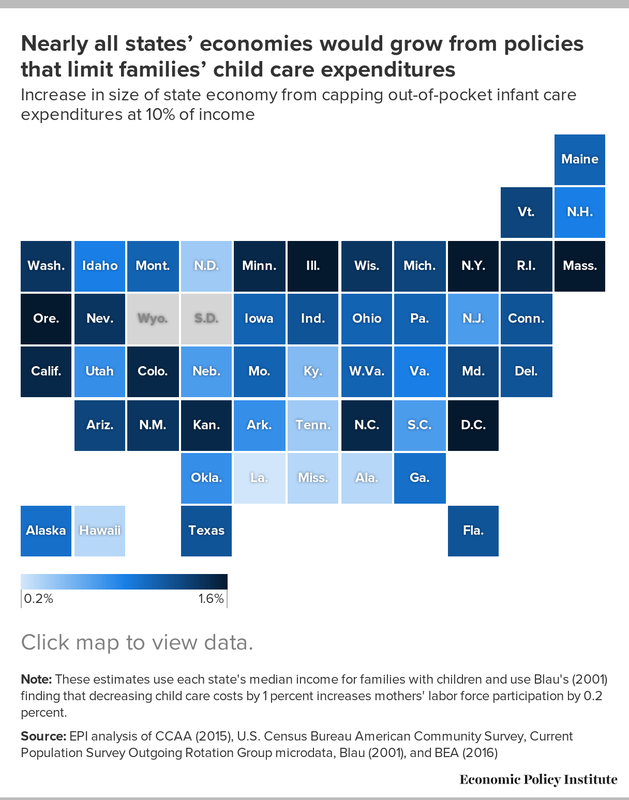 Even if policymakers decided to address just one component of the difference in social policy between the U.S. and these peer countries and made an ambitious investment in accessible, affordable, and high quality child care, many more parents, especially mothers, would be available for paid work. If child care expenditures were capped at 10 percent of a family’s income, GDP would increase by as much as 1.2 percent, or $210.2 billion. A full menu of work–family policies ranging from paid family leave to affordable child care could go a long way in making it easier for women with children to enter or stay in the labor force. As a result, mothers’ labor force participation would increase substantially, helping to boost economic growth and close the gender employment gap and gender wage gaps. 1. These estimates use assumptions and methodology similar to Shierholz, Heidi (2014) “Paid leave is Good for Business” DOL Blog, December 19, 2014. Specifically, the percent change in GDP is approximated by the percent change in productivity + the percent change in average hours + percent change in employment. Assuming no changes in productivity and average hours, the percent change in GDP = the percent change in employment. If there was a large boost in employment, then it is likely that not all else would be equal; productivity and average hours worked might also change. Nevertheless, this exercise provides a back of the envelope sense of the amount of national income being “left on the table” due to the lower female labor force participation in the U.S. than our peer countries.